A chance to acquire one of the nicer colourways in this series of Novelty Tableware from Carlton Ware. This is a pair of Eggcups, designed by Roger Michell (Lustre Pottery) and produced in the 1970s, these being dated 1973. 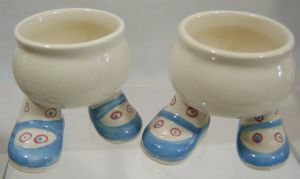 These eggcups have mid-blue shoes with the red and blue spotted socks. These examples are in perfect condition, with the usual light crazing often found. There are no chips/nibbles nor restoration work. They are appropritely backstamped and dated 1973.